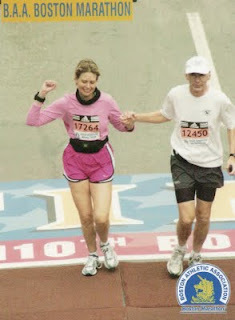 After the way things turned out for Boston in 2006, Karla and I agreed that someday after her recovery we would return and race Boston, not just finish it. I don't recall the exact moment but sometime last year we decided it was time to get serious and start back training for it. Of course first I had to get over the nagging injuries of last year and I did have an Ironman I was committed to training for this past June. But you have to start somewhere so after taking off all of last December to let my legs finally heal we started meeting on Saturday mornings to build up to the long runs that we knew would be neccesary. Once I completed the Ironman in June then we could really get serious and I could devote more energy to running and less on the swimming and biking. A couple of weeks after CDA, we began making weekly trips on Tuesday to the track to began trying to find some long lost leg speed. I also began running more days per week, getting up early before work some days to get in those extra runs. I also would do some tempo runs or repeats on Thursday. About this time Lisa Howell began to join us on our long runs. She is in the same age-group and had the same goal of running a Boston Qualifier at OBX. It is nice to have her along and on the days I had to miss the Saturday runs she and Karla could still get in a long one together. Things have been going well. I am feeling better and running faster than I have in a couple of years. Karla is completely recovered from the cancer and is stronger than ever setting a 5k pr and just missing one in the half-marathon. Unfortunately Lisa had a hip injury and although she is back running again she had to drop out of the marathon this weekend. She will be running the 8k though and she and husband Mike are hosting me for the weekend in Nags Head. To be honest, it will take a small miracle for me to run the 3:35 I need. All the indicators of recent races and workouts point to a more realistic chance at running 3:40-3:45 but hey, no guts no glory right? So I'm going to line up with the plan to give it my best shot. Most likely I will end up in a world of hurt but you never know. It could happen. Really it could. I think Karla is in great shape and will run a great race and qualify easily and if not for the injury Lisa would have been there too. But whatever the outcome we'll have a wonderful weekend. Look for a report soon. I hope you have the BEST of luck this weekend! Pray for a north wind to push you south!! Wait for me at the finish line . . . I'll be along!! !